If you recall from the plumbing post, the water comes in through a garden hose and splits to the sink and shower immediately once inside. I wanted the sink to be versatile and compact. So I designed and built it in my living room (so I could keep working after dark when it was cold). I cut all the pieces before I brought them home. 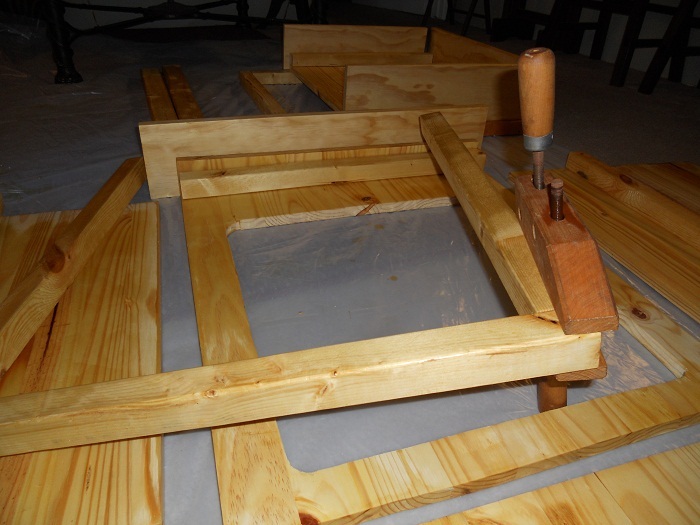 Then my wife and I stained each piece and let them dry overnight. I pre-drilled each hole to avoid splitting the wood with the screws. 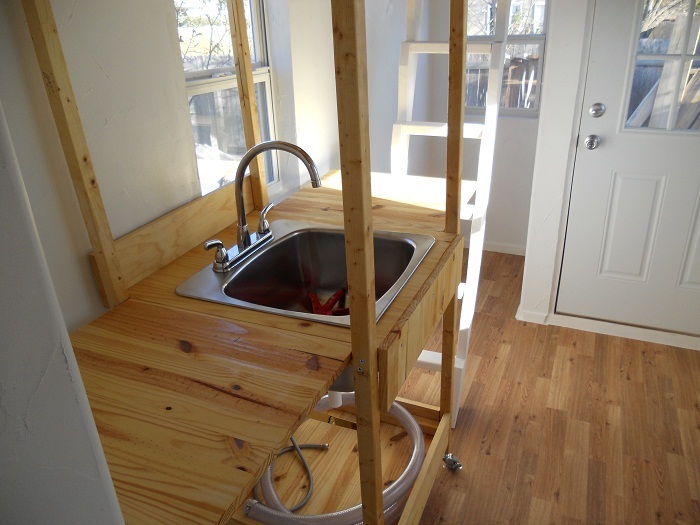 Once the sink was assembled in place in the tiny house, I put another layer of stain on it. Sink installation was fairly easy after that. I didn’t need the universal undermount kit I’d been advised to get. I did need a separate faucet and drain connections as well as clear silicon adhesive to seal it all together. 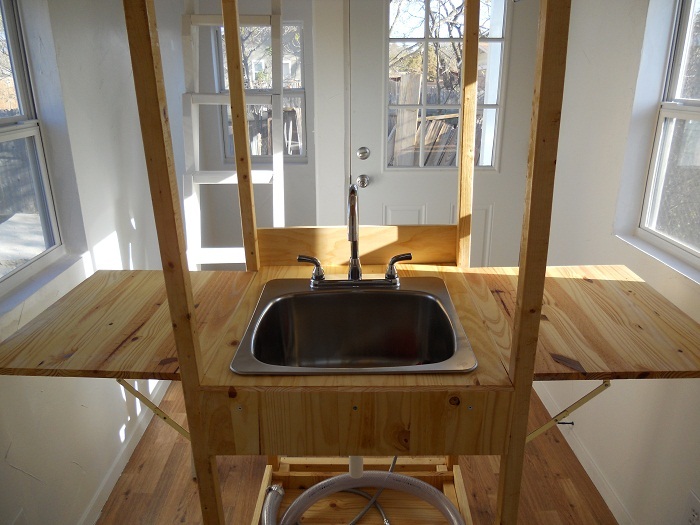 The sink is on locking wheels and has shelves that fold up on each side. 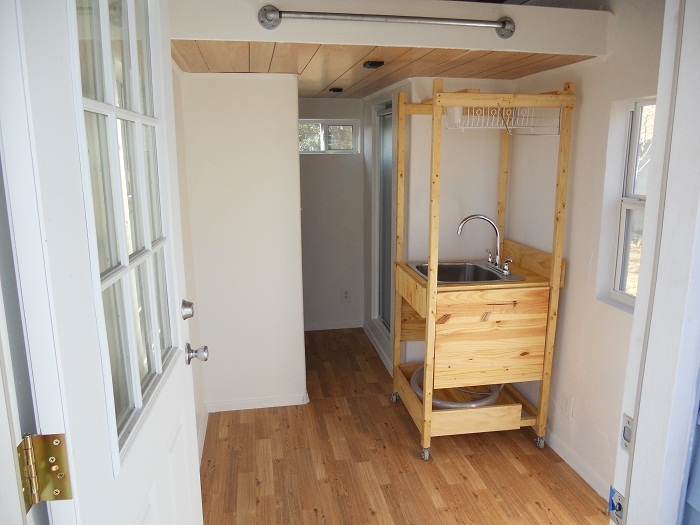 It has a deep laundry bucket sink and overhead dish and hand towel racks. For the drain you can see in the pictures there’s a 6 foot hose that can be connected to drain into the shower. Otherwise, you can use a bucket if you’d like to hand irrigate or find that more convenient. If you’ll recall, the toilet is a composting toilet. I more or less was looking for a stand that I could make light, portable, water proof and comfortable. I came up with an outdoor chair with a toilet seat attached. I even went in for the nicer seat that has pressure hinges to let itself down nice and slowly so there’s no harsh banging in a small space. 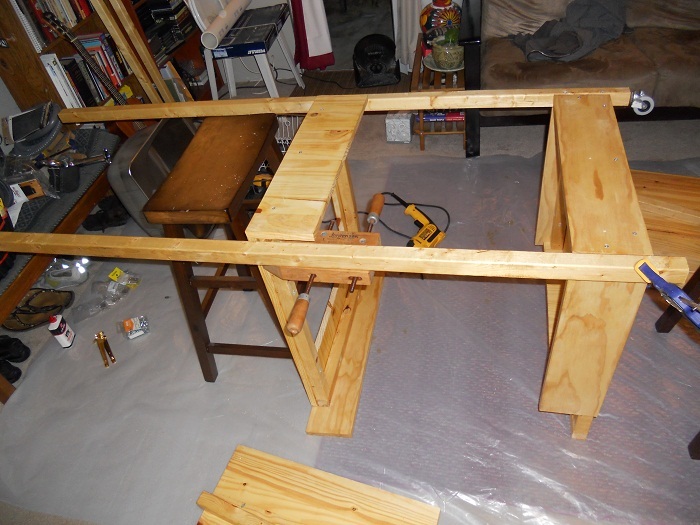 I used a reciprocating saw to cut the back off the chair and a jig saw to cut out the hole. 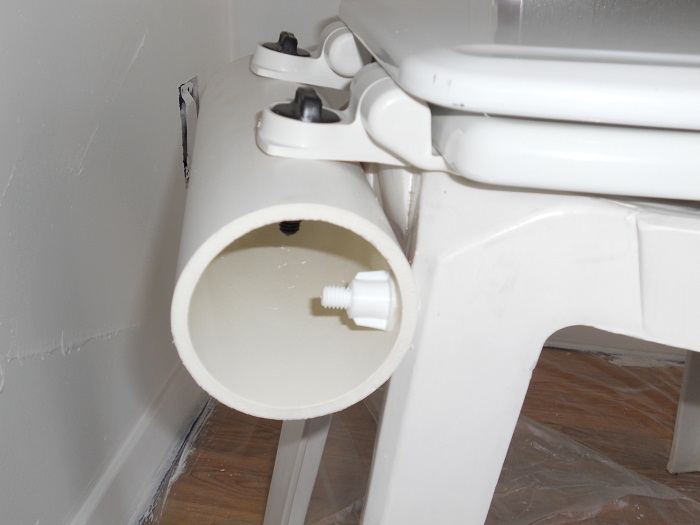 I needed a length of PVC and an extra set of toilet bolts to complete it. Now it’s in the bathroom over the bucket for it. You can leave it in there to take a shower or take it out since it’s so light. This entry was posted in Building Techniques and tagged tiny house sink, tiny house toilet. Bookmark the permalink. Thanks Alex. It is exciting. And it’s actually already done now. I’m just catching up on my photos and posts. Great, looking forward to whenever you publish them. I love your idea using the plastic chair. It can be removed from the house, scrubbed down and hosed off and sun bleached. Very sanitary! Thanks, Victoria. That’s exactly what I had in mind. It’s also very light weight. I must be missing something…. what about the odor and where do you dump the contents? 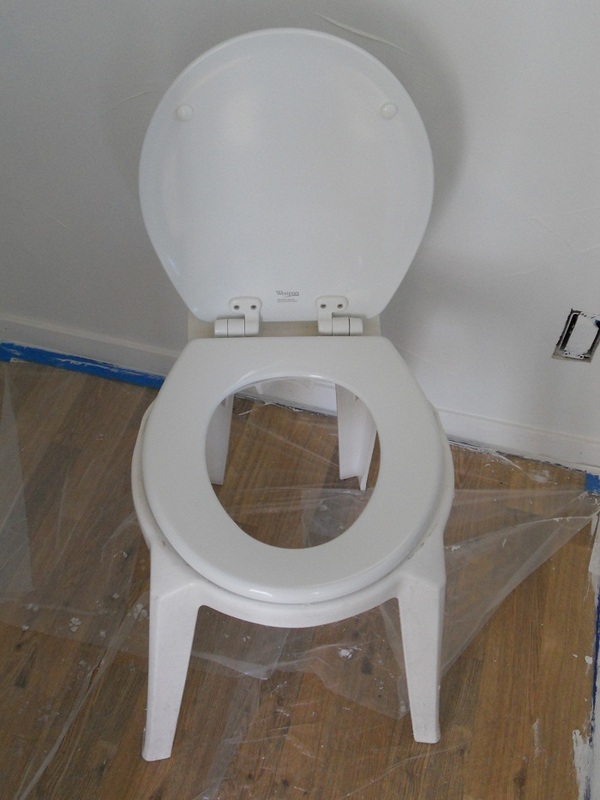 I am looking for options for a composting toilet for our tiny house and the text indicates this is a composting toilet. Could you give me a little more info please? Thanks! btw…. 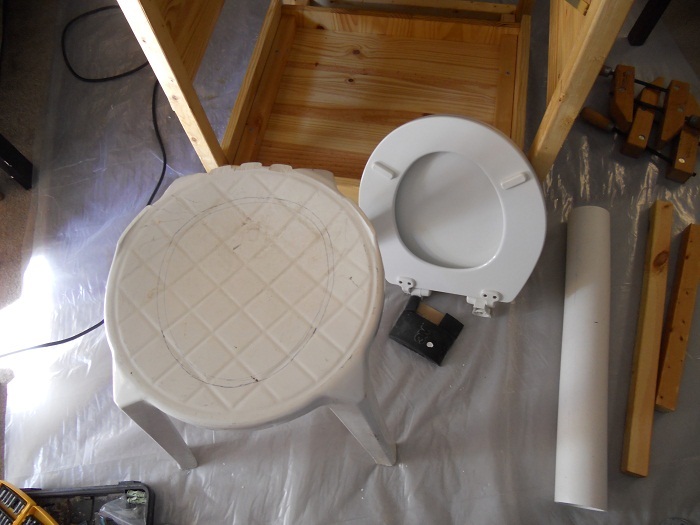 ingenious idea for a chair and seat and bucket…. main concern is the odor. Robin, you cover the contents as you go – sawdust is best. It won’t be 100% odor free but that’s how you do it. When the bucket fills, you add it to a compost pile outside somewhere. I took the idea from The Humanure Handbook.